1910: Nebraska's athletic board decides to look for a single coach for football, basketball and baseball. (Full story here.) Also, the trip to England for trainer Jack Best is a go after sufficient funds are raised. 1920: Nebraska asks to be readmitted to the Missouri Valley Conference. 1925: First-year coach Ernest Bearg starts evaluating the talent on hand as the team goes through its first scrimmages of spring. 1930: Coach Dana X. Bible gets spring drills under way and plans a series of Saturday intrasquad games that will be open to the public. 1940: Spring drills begin for Biff Jones Cornhuskers in favorable weather. 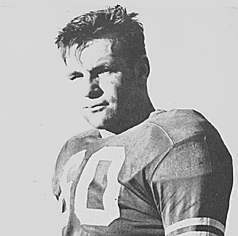 «1950: Tom Novak's number 60 is retired. Also, the Huskers' first outside drills of spring practice draw a crowd of about 500 spectators. 1955: Sixty-nine players report for the opening of spring practice. 1960: Bill Jennings says players will be allowed to pursue different positions during spring drills. 2000: Frank Solich assesses the holes he must fill on defense (1, 2*) and says Eric Crouch* will see light duty in spring drills.